I received free samples and/or compensation for this sponsored post, however my opinions are my own. My family loves chicken and I think they could happily eat it just about any day of the week. I love chicken because it’s a healthy meat and easy to prepare in most recipes. My family also loves to visit our local Cheddar’s because of the amazing food and excellent service we receive upon every visit. The month of September also just happens to be National Chicken Month at Cheddar’s Scratch Kitchen! This month Simply At Home Mom was invited back to Cheddar’s to try out some amazing chicken dishes for National Chicken Month. As usual, the service and atmosphere was amazing and we couldn’t have asked for a better visit. It was sooo hard to decide on what we wanted to try, but we finally settled on the Key West Chicken and Shrimp and the Grilled Chicken Alfredo. The Key West Chicken and Shrimp is a favorite for a reason! It’s just bursting with flavor from the pineapple pico de gallo to the tender chicken and the spicy kick from the shrimp. Everything was seasoned to perfection….not too much and not too little and the dish was fresh and reminded me of warm tropical days. It’s a dish that I would definitely order again. Hoping for a hearty, traditional pasta meal we also ordered the Grilled Chicken Alfredo and were not disappointed. This dish comes with plenty of tender veggies, flavorful chicken, pasta, a creamy alfredo sauce and topped with melted cheese. We loved every bite and due to the very generous portion sizes, we had to take the remainder home with us. Once again, we were wowed by the delicious food, amazing prices and all around friendly, prompt service at our local Cheddar’s. It has become one of our top restaurant choices in our area and we recommend it to everyone we know. We love heading out for a wonderful meal when we are celebrating or just in the mood to let someone else do the cooking, but I still love serving homemade dinners at home. 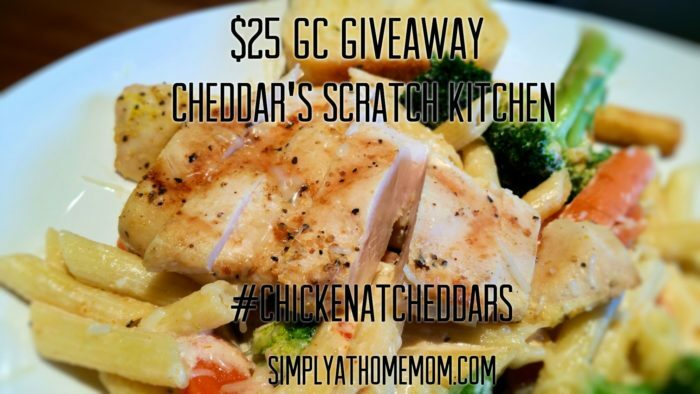 Cheddar’s has provided some great Scratch Facts to save you time when cooking chicken at home! I’ve saved the best for last once again! Who’s ready for a giveaway?! Would you like to win a $25 gift card to visit your local Cheddar’s? This giveaway is open to USA residents only ages 18 and over. Winner will be chosen within 48 hours of giveaway end and notified via email. If no response is received within 24 hours, a new winner will be chosen. Enter the giveaway below and good luck! Next post: Its almost time for Christmas Lights!